The NOW Society began as a community initiative designed to support the vibrant community of Vancouver improvisers. At its formation, the Society presented a critical mass of musicians who gathered together, committed to expressing and presenting improvised creation and to elevating their art through sharing music with their community and on international stages. The founders of the Society included Lisle Ellis, Paul Cram, Paul Plimley, Gregg Simpson, and Ralph Eppel. Since its establishment in 1977, leadership has incuded Gregg Simpson, Clyde Reed, Paul Plimley, Bruce Freedman, Graham Ord, Kate Hammet Vaughan, Don Druick, Roger Baird, and for the past few decades, Ron Samworth and Coat Cooke. Recently, in the spring of 2014, there was a decisive change in leadership when the Artistic Director Coat Cooke passed on artistic directorship of NOW to Lisa Cay Miller. NOW has a history of presenting stellar new works by the NOW improvising ensembles in unique and engaging concerts, of collaborating with and performing premieres by international artists (such as Barry Guy, George Lewis, Butch Morris, Marilyn Crispell and Roscoe Mitchell) of commissioning new compositions by Canadian composers (such as François Houle, Giorgio Magnanensi, Joane Hétu and Rainer Wiens), of international touring, and of producing celebrated recordings and publications. Recent guest artists include Lori Freedman, Jean Drome, Joane Hétu, Christine Duncan (Montreal), Anne La Berge, Ig Henneman (Amsterdam), Jim Denley (Australia), Pauline Oliveros, Lisle Ellis and Eyvind Kang (USA). NOW has successfully deveoped and maintaned audiences looking for new and challenging musical experiences and is proud to continue to present creative improvised music to their community. 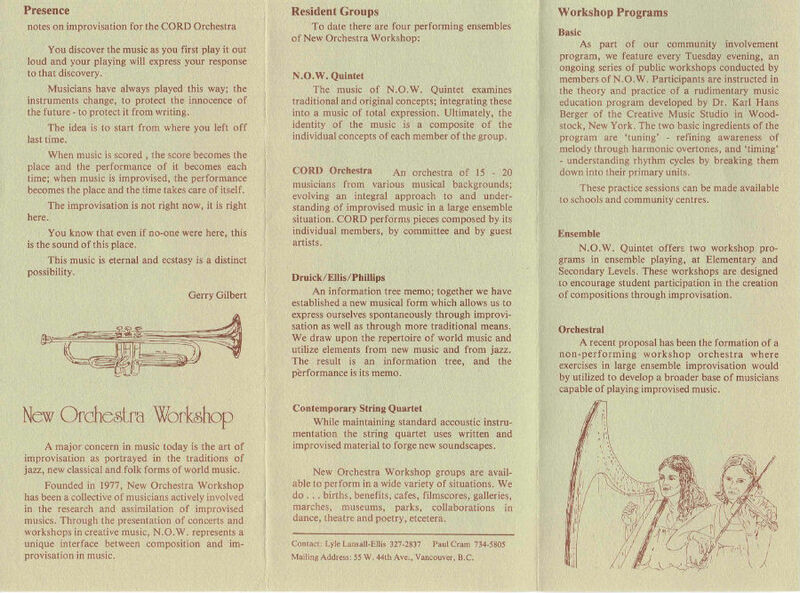 The New Orchestra Workshop Society has been presenting workshops to the public for 40 years. The first NOW workshop took place at the Western Front on april 6 1978, facilitated by Karl Berger, the founder of the Creative Music Studio in Woodstock, NY. 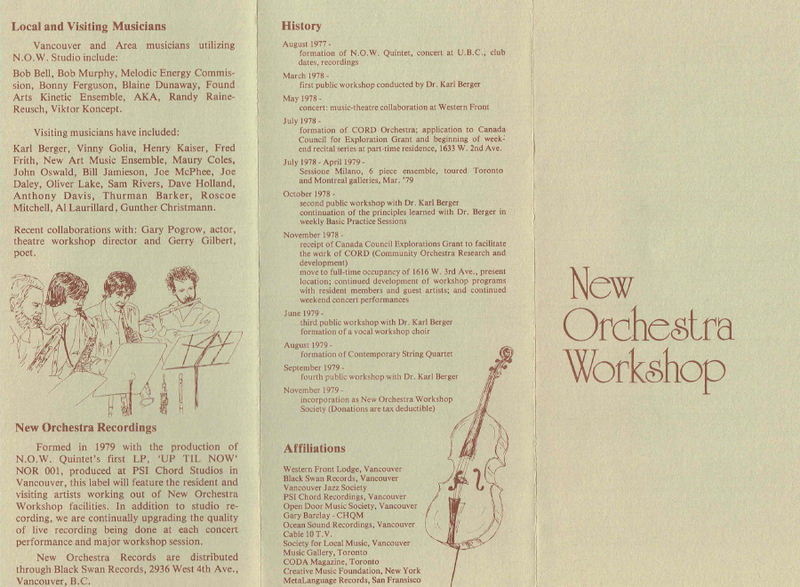 In the same year, the New Orchestra Workshop Society presented workshops by Anthony Davis, Oliver Lake, and Sam Rivers. in 1979, weekly workshops at the Western Front began (42 that year) and the NOW Society continues the tradition of yearly workshop series at the Western Front NOW with facilitators such as Pauline Oliveros, Eyvind Kang, Kim Myhr, Lori Freedman and Kris Davis.